Rail For the Valley is holding an open house in Chilliwack this Thursday to showcase the issue of passenger rail service in the Fraser Valley. The goal is to inform the public as to the current state of activities and to gain additional support. This event is open to the public and directed towards the City of Chilliwack. The open house will offer a chance for the public to see details of the campaign including track details, benefits, and ways to help with the movement. If you have any questions regarding this event, please email rftvfriends@gmail.com. Refreshments will be served. We hope you can stop by for a few minutes. The Streetcar Demo has been a phenomenonal success, but the trial is slated to end on March 21. In light of its success, there is a major push on to extend the service indefinitely. 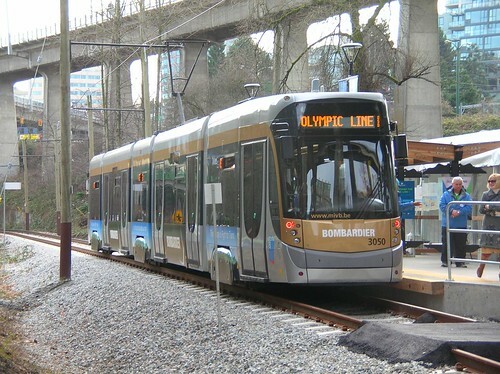 Such a small line (only 1.8 km long, from Granville Island to the Olympic Village) could end up being the tiny seed that begins the construction of a light rail and streetcar network eventually encompassing the whole of Vancouver and the Fraser Valley. So, LET’S RALLY, and Ride the Rails on Saturday March 20 the first day of spring, in support of Light Rail and streetcars for Vancouver and the Fraser Valley. Take the whole family, and make it a day. After the rally, visit Granville Island on the first day of spring! 2) Get off at Olympic Village Station (6th Ave). 3) Ride the Olympic streetcar! The following is a Rail for the Valley media release to kick off 2010. This new year is a particularly special one for advocates of passenger rail for the Fraser Valley. 2010 marks the 100th anniversary of the initial Interurban rail service that used to connect communities from Chilliwack to Vancouver. So far, the anniversary is being commemorated by the Chilliwack Museum with a special year-long Interurban exhibit. The Rail for the Valley campaign is hoping for much more. 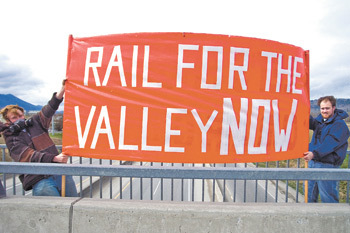 -On April 11 2009, ahead of the provincial elections, Rail for the Valley supporters organized a ‘historic’ Day of Action, holding up banners in support of passenger rail atop Highway 1 overpasses all the way from Chilliwack to Vancouver, on more than 20 overpasses in all – a feat never before accomplished, thus illustrating the deep and widespread public support for the cause. -Later in 2009, the South of Fraser Community Rail Task Force, headed by Langley Township Mayor Rick Green, was established to help Fraser Valley communities lobby senior levels of government for such a service in a unified way. Rail for the Valley‘s latest online petition for passenger rail service, viewable on http://www.railforthevalley.com, has garnered more than 800 signatures so far, including hundreds of thoughtful comments posted in support. “We must hold our politicians to account on this, or there will be backsliding. Any shift away from the status quo is naturally resisted by political inertia, and we have to be on the highest guard for it. As we pull out of this recession, the price of gasoline will likely jump dramatically again. With the way the Fraser Valley is growing and the rest of the world is changing, we absolutely must see a fundamental shift in priorities away from incremental and exorbitantly expensive Skytrain expansion, and endless highway expansion, towards beginning right now, today, to build light rail infrastructure for the Lower Mainland, for today and for the future,” declared Buker. The Rail for the Valley Campaign would like to wish the public and all of our supporters a very Happy New Year, and all the best for 2010. April 11, 2009: Two young Rail for the Valley supporters hold a banner on a Chilliwack overpass, part of our Highway 1 Day of Action. Today marks the one-year anniversary of the Rail for the Valley Campaign Blog! Readership (now at 300-400 hits per day) has grown dramatically since last December, when the Campaign Blog was initially launched and the readership was… well, 0. When I first created this blog, I had in mind a place where I and others could regularly congregate and contribute – not necessarily “News” items – but our thoughts and items of interest, a place to communicate and get ideas flowing. In that regard, the blog has so far been a success well beyond my expectations. At the time, I asked Zweisystem if he would like to be a contributor. I had no idea how quickly he would adapt to blogging, to getting debate going (and certainly not always preaching to the converted! ), and how adept he would be at building our readership, both locally and in fact around the world. I know today we have visitors from every place you can imagine – to our international readers, I’m glad you have found this blog and are enjoying it! In the new year, you can look forward to an increase in the number of “guest posts” on this blog – and if all goes well, new regular bloggers as well. You don’t need to be an expert on the Fraser Valley, or on all things light rail. A well-written post from a personal point of view is just as good. We’re looking for both local, as well as international perspectives. 2) regular contributors, whether it be once a week, or more frequently. If you’d like to contribute, or if you know someone else, please send an email to railforthevalley@gmail.com. If you have a passion for the issue of Rail for the Valley, and an enthusiasm to write for us, please come forward! Robert Blacklock’s Letter to the Editor was certainly a disappointing read. (He almost had me convinced!) 3 hours to get from Chilliwack to Surrey? I completely agree, no one would take that train. Fortunately, the facts don’t at all square up with Mr. Blacklock’s assertions. In fact, readers may remember a demonstration service was implemented for 6 months on the Interurban line between Abbotsford and New Westminster during Expo 86, using old Pacer Railbus trains (for $12/round trip). Total travel time was 2 hours, including delays at the Fraser River Rail Bridge, and was highly popular with the public. Using modern light rail technology, some track upgrading, and construction of crossings where needed, I am confident that today one could travel to downtown Vancouver in even less time, and it would on average be comparable to travel time by car, because trains would not be affected by regular ‘rush hour’ traffic congestion. Such a service could reliably be used by the public for travel throughout the valley, regardless of traffic or weather conditions. 1) A single Light Rail Vehicle (LRV) unit (passenger train car) can transport more people than a bus. As well, if there is overcrowding, more units may be added to a train as needed, without the added cost of additional drivers. 2) The lifetime of an LRV is about 3 times as long as the lifetime of a bus, with much lower maintenance costs. This is in large part due to their running smoothly on steel tracks, as opposed to jostling in the midst of traffic on roads. 3) Throughout the world, including Canada, it has been shown time and time again, that people will not get out of their cars to ride a bus but they will get out of their cars to use light rail. The cost of operating a near-empty bus route is far greater than the cost of operating a popular light rail route. In fact, light rail may eventually turn an operating profit. This is seen on many routes throughout the world with similar populations and densities to the Fraser Valley. The ‘pie in the sky’ picture of light rail painted by Mr. Blacklock is a fiction. Municipal leaders involved with the South of Fraser Rail Task Force are to be commended for looking beyond these myths, and beginning to take the first steps toward implementing a Valley-wide light rail service. Rail for the Valley is neither a fantasy nor a luxury. It is a necessity, whose time has long since come. TRI-CITIES (NEWS1130) – Two community action groups are calling on senior governments to scrap plans for SkyTrain expansion and concentrate on at-grade light rail, which they say is a less expensive option. The request comes from the community action groups ‘Rail for the Valley’ and the ‘Light Rail Committee’ who are calling for an at-grade light rail system for both Surrey and the Tri-Cities area. They say local mayors, like Surrey’s Dianne Watts, already understand the potential exists to rapidly expand the light rail network using a mixture of track-sharing. The Light Rail Committee also says the proposed Evergreen expansion is not the wisest choice. The group says the Tri-Cities area would be better off with diesel-electric light rail vehicles, which is something the Committee proposed years ago. …and how it could mesh with express passenger rail service to Seattle and points south. Rail For The Valley asked South of Fraser candidates where they stand on light rail. The project would encompass the communities of Chilliwack, Abbotsford, Langley and Surrey, and offer a twice-a-day excursion service for residents by the summer of 2010.